Transform your memories into stories! Storyteller Ellouise Schoettler and novelist Solveig Eggerz team up to lead a panel focusing on the benefits of good oral storytelling to the writer. Panelists are Jessica Robinson, Dario DiBattista, Len Kruger, and Pat McNees. Admission is free. Celebrate three authors whose first books have been published by the Santa Fe Writers Project. Daniel M. Ford reads from Ordination, book one in the Paladin Trilogy. He is joined by novelist Brandon Wicks, author of American Fallout, and Tara Laskowski, who reads from her engrossing collection of short stories, Bystanders. Admission is free. JosephRoach: "Stars Down to Earth: Materializing Celebrity"
Joseph Roach, Yale University, discusses the cult of literary celebrity surrounding Shakespeare and Austen. Tickets are $15, $10 for members. Douglas LaPrade of the University of Texas, Rio Grande Valley, delivers a lecture on the WWI, Spanish and Cuban influences in Ernest Hemingway’s work at 2 p.m. in the Pickford Theater. Event is free. Experience the work of our 2015 Emerging Writer Fellowship winners, Clifford Garstang and Brian Simoneau, at a free open door reading. Author, University of Maryland professor of English, and consulting editor for The Shakespeare Quarterly Theodore Leinwand discusses his new book The Great William: Writers Reading Shakespeare. Admission is free but reservation is required. The 11th Hour Poetry Slam offers an opportunity for poetry lovers to enjoy the competitive art of late-night performance poetry! $5 for tickets. Author W.K. Dwyer will be discussing his first novel, The Killing Flower. Admission is free. Youth-focused and youth-led, Youth Open Mic is a monthly series that features student poets, singers, musicians and actors from the DC/Maryland/Virginia area. Tickets cost $5. Sunday Kind of Love Open Mic Poetry features emerging and established poets from the Washington, D.C. area and around the nation. $5 for ticket. Terri Cross Davis and husband Hayes Davis read from their books, Haint and Let Our Eyes Linger, respectively. Admission is free to this open door reading. Rob Casper, head of the Poetry and Literature Center will lead a discussion with poets/editors, Cathy Park Hong (New Republic), Don Share (Poetry Magazine), Evie Shockley (Feminist Studies), Carmen Giménez Smith (Puerto del Sol/Noemi Press) on the ways poetry helps us navigate race in contemporary American culture. Join us to hear Natalie Eve Garrett in conversation with contributor Jeffrey Renard Allen about The Artists' and Writers' Cookbook (Powerhouse Books). Admission is free. The Writer’s Center presents a series of readings from books set during the early 20th century. Admission is free. The Zora Neale Hurston/Richard Wright Foundation was founded in 1990 and is dedicated to discovering, mentoring and honoring Black writers. The Legacy Awards honors the best in Black literature in America and around the globe. Join us for a reading by 2016 nominees. Sign-up starts at 7 p.m. in The Den. Then grab a drink special, put on your thinking cap, and head upstairs for three rounds of mind-bending trivia by 8 p.m. Prizes awarded. Trivia night is open to all ages. Admission is free. Fighting Cancer With Poetry, Inc. in partnership with Busboys and Poets cordially invites YOU to another installment of our renowned Poetry Jam Fundraisers. Admission is free. Come share your poetry, fiction, and nonfiction works! Sign-up for readers begins at 1:30, and the reading starts at 2:00. Admission is free. This Poetry Slam, Inc certified slam event meets the last Tuesday of every month at Busboys and Poets' Brookland location. $5 for ticket. Tickets include one copy of In the Company of Women and one beer or glass of wine. Cost is $50.00 + $3.74 fee. Join author Robert Barsky as he discusses and signs his book Hatched. Admission is free. American Sign Language users and viewers from all corners of life will come together to recite a poem, song, short skit or jokes. Come out and enjoy the wonderful environment while you eat, get your drink on and socialize. Great for those learning American Sign Language. $5 for ticket. Poet Rachel Eliza Griffiths is joined by long-time workshop leader John Morris, who reads from his collection of short stories, When I Snap My Fingers You Will Remember Everything. Admission is free for this open door reading. Meet the Instructor offers insight into the teaching styles and personalities of our instructors. This time around, we spoke with Tyrese Coleman, who will lead Developing Your Flash Fiction, an intermediate/advanced class that runs from October 22 through December 3. Tyrese Coleman: I am a The Writer's Center alum. I began my writing career taking courses at the Writer's Center. It was through those courses that I realized I wanted to study creative writing more in depth. I was encouraged by my then instructor to apply to Johns Hopkins, and I haven't stopped writing since. I always wanted to return to the Center to hopefully be for others what my instructor was for me: the encouragement I needed to pursue my dream. TC: I believe the cornerstone of good critique is a mix of encouragement, knowledge, and honesty. My style is one that revolves around those principles, with an added touch of humor and diversity. We are adults who want to create something meaningful to share with the world. My teaching style keeps that goal in mind as a concrete point of achievement. TC: There are way too many books lingering on my bedside table. I'm currently on 13 Ways of Looking at a Fat Girl by Mona Awad, and will then move to Slouching Towards Bethlehem and The White Album by Joan Didion, and Slumberland by Paul Beatty. TC: Right now I am working on two projects, one is a short story collection and the other is a hybrid collection of stories and essays. For those collections, I am writing flash fiction and memoir, plus longer pieces for publication in journals. TC: My living room, LOL! I have an office, but I never work in it. In a corner of my living room is a cushy mustard-colored, mid-century styled club chair with a matching lamp above it and a small table right next to it. My laptop rests on a pillow on my lap; any papers or books go on the side table along with a glass of wine. Once my kids are in bed, the only sound you can hear in my living room is the tapping of computer keys and maybe my dog snoring. TC: Ever? Oh, that's hard to answer because I've received such good advice, and my memory is really bad. So, I will go with the best advice I received recently. I conducted an interview for The Rumpus with another The Writer's Center instructor, Leslie Pietrzyk, who said, "Think about the stories you have inside that scare you. That's what you should be writing." This advice is so crucial for us storytellers who really want to get at the heart of the matter, the brutal truth of life. I hope to challenge my students to write those stories and put them out into the world. Tyrese L. Coleman is the fiction editor for District Lit, an online journal of writing and art, and a graduate of the Writing Program at Johns Hopkins University. A 2016 Kimbilio Fiction Fellow and Virginia Quarterly Review Nonfiction Scholar, her work has appeared in numerous publications such as PANK, Washingtonian Magazine, The Rumpus, and listed in Wigleaf's Top 50 (very) short fictions. The ‘Meet the Instructor Series’ offers insight into the teaching styles and personalities of our instructors. This time around, we spoke with Jenny Chen, the leader of How to Pitch Magazines and Sell Your Work, an online beginner-level class that will run from October 15 through November 5, 2016. Jenny Chen: I took my first class at The Writer's Center many, many years ago. It was a class for high school students on fiction, taught by Barbara Esstman. Since then, I've attending Writer's Center events and have always felt grateful for its presence in the D.C. community. JC: Encouraging and specific. I like to help people enjoy the process of writing and to give specific, actionable feedback. JC: A lot of Junot Diaz. JC: I write all over the place and I travel a lot, so my writing space is generally a coffee shop with a notepad. I'm happiest when I'm minimalistic. JC: Oh dear . . . so many good pieces of writing advice and I can't even remember them when asked. My brother, who is a visual artist, always challenges me to be more concrete and specific in my writing, and has absolutely transformed my writing in a way that no writing teacher has ever done. Jenny Chen is an award-winning science and health journalist. Her writing has appeared in publications such as The Atlantic, The Washington Post, The New York Times, Shape, and Marie Claire. 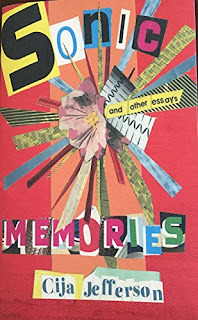 Cija Jefferson, Baltimore resident and author, recently self-published her first book, Sonic Memories/and Other Essays. The inspiration for Cija’s collection of personal essays came from an assignment at the University of Baltimore's Creative Writing & Publishing Arts MFA program in which graduates were required to design and write a book. Although the collection began as a class project, Cija says that “the process of pulling essays and putting them together was very organic.” On the main floor of The Creative Arts Alliance for Cija’s book launch party, where I met Cija, chairs are set up facing a screen that has a slideshow of pictures from her life—her as a baby, she and her sister wearing matching dresses, her with a group of friends from college. It’s a surreal experience to see the characters from Cija’s essays suddenly come to life. Cija initially planned to focus this collection on her post-college years when she lived in California. Her original working title for the book was, “Which Way Home.” However, guided by her mentors in the MFA program, Cija decided not settle on a fixed theme. Instead, she let her writing take her along for the ride. The result was a coming-of-age story told through a wide range of essays that span from her early years as a trouble-loving child, to her young-adult years when she struggled to find her place in the world, and ultimately, to the place she is today— where she says she’s beginning to let go of the negative voices in her head and pursue her true purpose in life: writing. At 105 pages, Cija’s book is an emotional roller coaster. Separating humorous anecdotes from gut-wrenching pain by little more than a page or two, Cija’s book is a raw exploration of growing up, and on how the choices we make in an instant—looking back at a hospital bed or stealing a piece of candy from a local store, for example, have lasting impacts on us even years after the they are made. Opinion Writing For Publication starts September 15! After eight years of writing and editing articles about marketing and managing small businesses—and spending my evenings and weekends polishing a literary novel—I reached a critical juncture. My novel was rejected by dozens of literary agents, and I wondered whether I should have gone to law school instead. It was in this dejected frame of mind that I wrote my first personal essay, and to my amazement it was published in The Guardian’s opinion section! Since my début in The Guardian, I’ve had success in placing op-eds in well-respected publications, including The New York Times, Reuters, Al Jazeera America, and The Baltimore Sun. I’ve come to realize that editors are constantly looking for opinion-driven articles, which is why I’ve had success publishing them. While some newspapers and magazines only work with their regular columnists, many save space for outside contributors. How else can the press remain vibrant, keep a finger on society’s pulse, and provide meaningful insight into hundreds of ongoing issues? Through the Opinion Writing For Publication workshop at The Writer’s Center, I will provide strategies and exercises to help you choose topics based on your sensibilities and experiences (as well as developing expertise) to create op-eds and get them published. You will learn to: perfect the art of making forceful arguments; know when to be subtle and when to not; craft a compelling narrative; figure out what one is trying to say as one is saying it; be aware of the power of aesthetics, humor, anecdotes; trust one’s intuition; and much more. Are op-eds everyone’s cup of tea? No! There are many exceptionally talented writers with absolutely no interest in writing opinionated pieces. Instead, the op-ed is the perfect medium for writers who have the desire to be thought-provoking and who wish to shape public conversation. If you tend to have contrarian opinions, if original ideas pop into your head regularly, or if you have expertise in one or more areas, I encourage you to join me. You will gain the understanding that an op-ed byline is an attainable goal—providing that you are willing to work hard—and that is a giant step toward success.